A vehicle crosses the Pharr-Reynosa International Bridge as tractor trailers and other vehicles wait to enter the United States on Friday, March 30, 2018, in Pharr. Just a week before the announcement, a thread at a statewide hearing in Weslaco was wait times at international ports of entry in Texas. 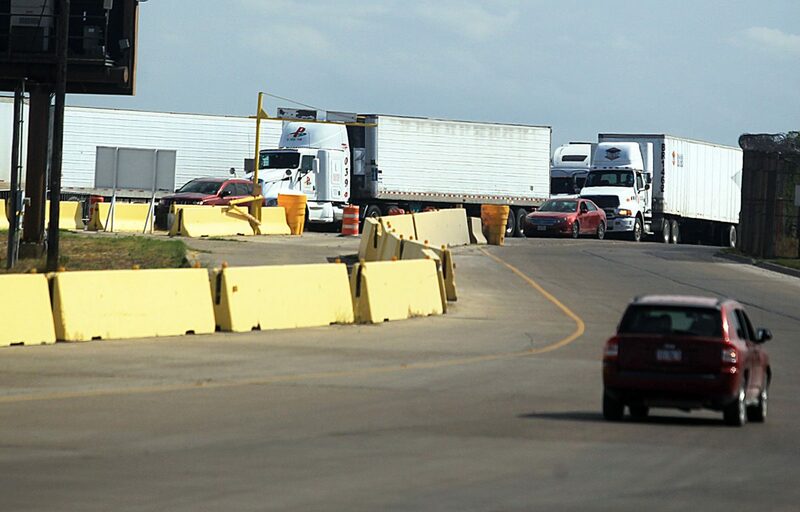 State representatives on March 20 questioned what has been a common conversation in the trade community over the past year, and an especially local one down the road at the Pharr-Reynosa International Bridge: Why aren’t unified inspections being implemented? Last week, Homeland Security Secretary Kirstjen Nielsen, alongside Mexican Foreign Minister Luis Videgaray, announced in Mexico City three accords — one of which echoed the demands of the Texas trade community. Unified cargo processing — a concept that would house customs officials from both the U.S. and Mexico under one roof to conduct cargo inspections simultaneously — would be implemented. The practice has been implemented at the Nogales port in Arizona, according to Pharr Bridge Director Luis Bazan. It has also been attempted at the Rio Grande City-Camargo International Bridge. But this announcement will hopefully enhance the busiest cargo ports, such as Pharr, Bazan said. “To us, this is a winner because our northbound truck traffic is booming and we’re really trying to reduce wait times,” he said. “These sorts of initiatives are overdue and have long been needed at our bridge crossings,” said former U.S. Ambassador to Mexico, Tony Garza. Texas International Produce Association President Dante Galeazzi said these unified inspections increase efficiencies. There’s also loads of paperwork that could potentially decrease, Galeazzi said. Once the program is implemented, Mexican customs officials will work on the U.S. side of the bridge, Bazan said. But the only trucks eligible for this program will have to be certified under the Customs-Trade Partnership Against Terrorism program. C-TPAT is a supply chain security program led by Customs and Border Protection. The process for businesses to become certified includes an application, security profile and vetting process. Once accepted, members must be validated within one year of being certified. Every four years, members must be revalidated. While the unified inspection announcement was received positively by many in the trade community, questions still remain. CBP did not provide answers to questions regarding the implementation process, and local officials are not sure how and when it will actually take place.